More miniature than expected, true magic energy delivered nonetheless! Absolutely beautiful Angel Aura! Included was a sweet and thoughtful note along with a nice gift! Thank you so much! Rainbow Moonstone is the "Yin" of the "Yang" in the Crystal World! Spheres, rutilated with Black Tourmaline available in four (4) sizes. Each Sphere is hand cut, hand polished and selected for its adularescence (blue and purple flash). A sizeable double-terminated Uruguayan Amethyst point with swirls of a baby-pink lavender color throughout a clearer, rainbow-filled piece. The clarity, color, rainbow landscapes... just beautiful! 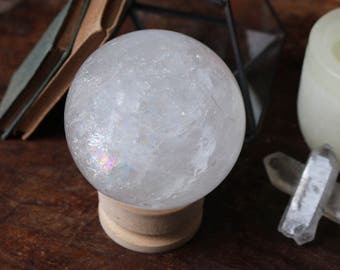 A large clear quartz sphere in front of a Labradorite Slab from Africa sprinkled with little Swarovski crystals. The Moon and a twinkling star filled sky . Good Mojo Father's Day sale in full swing! A Green and Pink Amethyst Geode accented with a string of tiny sparkly lights. So beautiful! In place of clear tape, we use mini stickers created from 25 years of photos. They're fun and they're re-stickable! Slightly larger than a quarter, heart-shaped Black Amethyst Geodes. Every single heart was hand-selected by me, for you! A naturally heart-shaped Agate geode opens to reveal multiple colors and is covered in sparkly druzy. Hand-dyed silk ribbon is just part of our gift wrapping. Repurpose to hang a sun-catcher or your favorite pendant. Born & raised in the NYC Metropolitan Area, mother of three incredible children, nature lover, horse, & dog owner. Artisan anything continues to amaze me. Music IS Love. Civil Engineering for 25+ years and decided to go with my heart❤️.